This One-of-a-kind Santa is approx. 18" tall, he has glass eyes, and a white mohair beard. His hands and face are hand-sculpted using Prosculpt polymer clay. 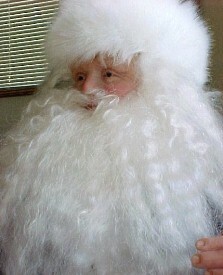 Santa is wearing the traditional deep red Santa suit trimmed in white faux fur. He has black boots and a black belt with large antique gold buckle. In one hand he holds a handmade leather ring of sleigh bells. The beautiful burgundy round-back sleigh Santa sits in, is a collectible heirloom-museum quality 18th and 19th century one horse open sleigh. The sleigh measures 27" L. x 14" w. x 15" h. This handmade sleigh (picture does not do it justice) is made of steam bent hardwoods & forged iron and many coats of paint to give it its beautiful luster. 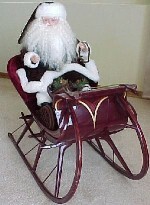 Sleigh also comes with its own certificate and serial number, and is made one at a time only a few are made per year.